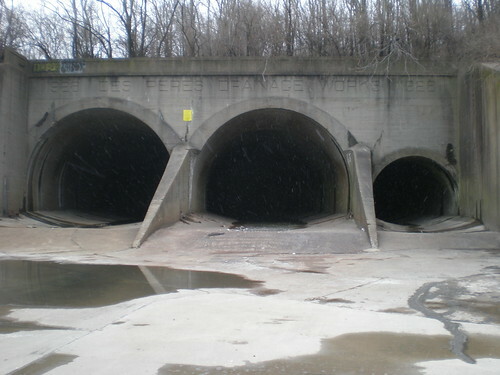 Today, to follow up yesterday’s post, I visited a tunnel entrance south-west of the strip mall at the intersection of Vernon and Kingsland. This turned out to be closer to the intersection of Harvard and Dartmouth. 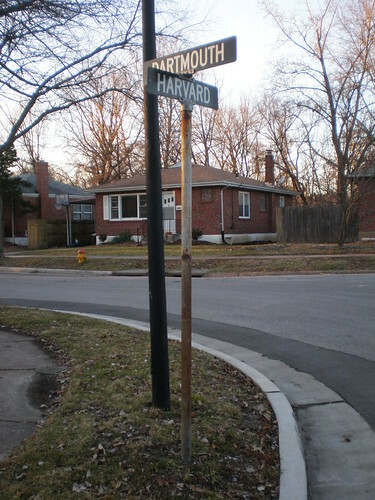 Just across the street from this sign is a driveway leading up to a small lot with a footpath pointing towards the aforementioned strip mall, a Vernon backyard, and a gate on the west side in front of some woods. 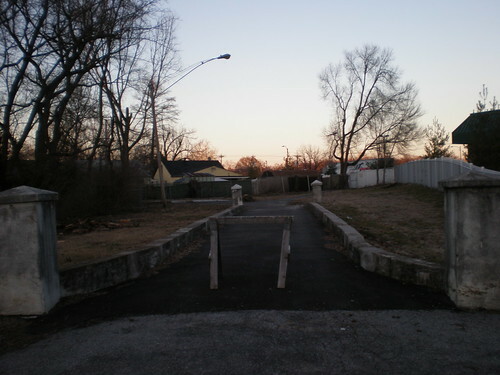 The driveway was impressive mostly because it appeared to lead nowhere. Through the gate, a winding, short path leads to the top of the tunnel. I was sad not to see a date inscribed anywhere, but being left with questions is nothing I want to complain about. I wonder where the other two tunnels at the Macklind Pump Station begin and even if this is in fact the last place the river sees the light of day before reaching that pump station. After leaving this tunnel entrance, I decided to visit another spot I had found while living in U-City last year, in order to look at it with a fresh set of eyes. 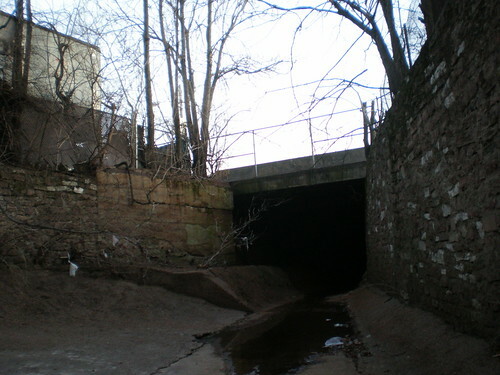 Accessible from Chamberlain Avenue, this tunnel continues a series of several tunnels covering this particular drainage ditch, sending its contents south under Olive next to B & K Tuckpointing. This tunnel is a fair amount smaller than the others I’ve been visiting recently, but it has a feeling of history and an urban character that made revisiting it more than worthwhile. My other photos from today’s exploration can be viewed here. 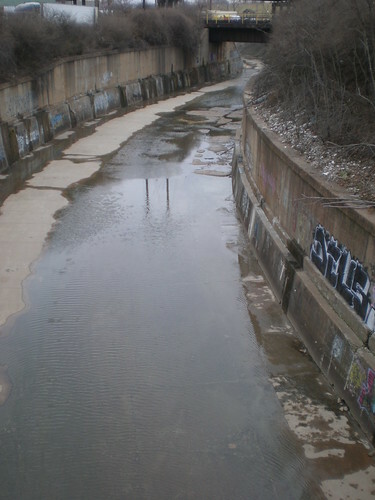 Inspired by both Michael Allen’s “The Harnessed Channel: How the River Des Peres Became a Sewer” and my own proximity to the river, I set out this morning to follow it until it went underground. An article in the West End Word identifies the beginning of the tunnel as being near Macklind Avenue and the Macklind Pump Station, so I set off walking along the river East from around Hampton alongside train tracks and huge industrial buildings. On foot and close to the “river’s edge” the size of the cement ditch is impressive, but from the surface its usefulness is hidden. 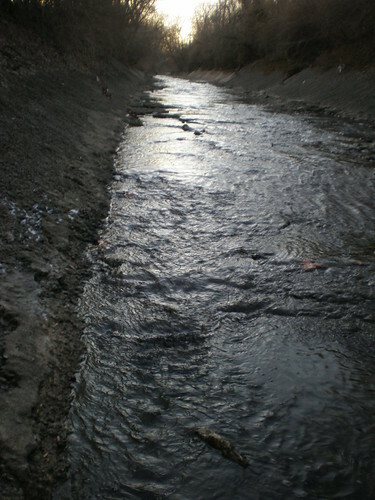 The river clearly represents a significant project but its dirtiness and emptiness make it harder to appreciate. Luckily a little further up the river I reached my goal and was able to feel the weight of the accomplishment that the River des Peres really is. I’m hoping to find the North tunnel entrance as well in the near future. My photos from the trip are here.